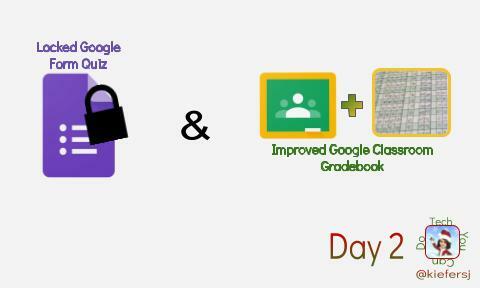 Tech You Can Do: Resources: Day 2: Locked Quizzes & more! Day 2: Locked Quizzes & more! Let's go through some pedagogy - YES! It'd be ideal to create all of your assessments to be questions that your students can't "Google" ... however, in reality, there are times where a teacher wants/needs to have the ability to focus students on doing the test in front of them. This new tool will allow teachers to do just that. As a bonus in the same article, Google announces they are improving their Gradebook in Google Classroom. Looking at the GIF (I'm a #hardG kinda gal), I'm super excited at the new layout! Seeing multiple assignments in columns all the way across the page will help teachers see with a glance at large amounts of work. Yea! the gradebook feature gives Google Classroom the look of a more traditional gradebook, but don't let that fool you ... it is NO traditional gradebook! Grading categories, your entire class at a glance, a complete picture of single student, and more. Bottom line on this one - you'll have to sign up and give each of these a go to really test them out. But both are wins to me!